For those who have followed the Sno-Core tour, or at least know anything about it, know that it has been a handful of years since the tour has been any good. 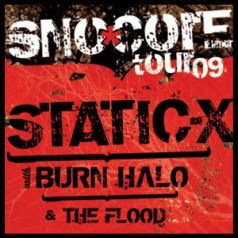 This annual tour has been in existence for 13 years now, and has played host to all sorts of genres of music and all sorts of amazing bands like Sublime, Blink 182, Primus, Fear Factory, Incubus and Seether to name a few, and this year, it played host to Static-X, Burn Halo and In the Flood. Saliva had to drop off of the bill due to vocalist Josey Scott needing ulcer surgery. Regardless of Saliva not being on the bill, the show was excellent. Yes, Saliva would have made the night a bit better but the bands that played still killed it. Burn Halo took to the stage this time in direct support of Static-X, and jammed a full seven song set of material off of their self titled debut. The show was pure dirt rock at its best – even though it sounds built for arena play. From the sets opener, ‘Anejo,’ to the closer, ‘Save Me,’ the band ripped through offerings like ‘Our House,’ ‘Gasoline,’ and lead single, ‘Dirty Little Girl.’ Frontman James Hart swooned and crooned in his own unique way, which is somewhat Steven Tyler-esque, all the way down to his American flag bandana tied to his microphone stand. Overall, the show was brilliant. It marked my fifth time see Static-X, and first since they toured for 2001’s ‘Machine.’ It was also my second time seeing Burn Halo, and neither band disappointed in any way, and I’m a hard man to please musically, so that’s saying something.